1. 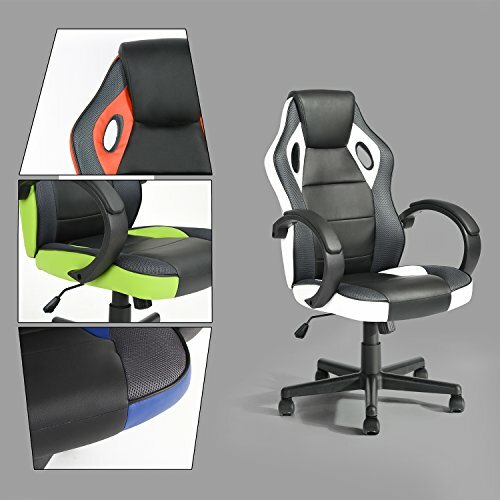 Luxury Design and Comfortable：Luxury car racing style design chair bring your enjoying video gaming funny better. Its bigger and thick padded seat cushion provide you feel comfortable during working days and wonderful experience while intense gaming moment. 2. High Quality Material: PU leather around seat back including armrest, easy to clean and good for you skin. 3. Humanized Wheels: 360 degrees swivel rotation with premium quiet rolling wheels-casters which is not only can avoid scratch your hardwood, rolling smooth on the carpet, but also nice looking. 4. Maximum Capacity: 380Ibs, the seat dimension: 19.4W*20.2D inch, chair dimension: 24.8W*26.38D*44.88-48.82H inch . 5. Easy to Assemble: just flow the instruct ion and one person can finished within 30 minutes.